The scientific name for the Red Eared Slider is Chrysemys scripta elegans of the Emydidae family. In the United States and the rest of the world the Red Eared Slider is the most popular turtle kept as a pet. It is native to the southern United States but has established itself in other areas due to pet turtles being released into bodies of water when it is no longer wanted. The Red Eared Slider is an aquatic turtle and gets its name from the red or orange patch of skin behind the eyes and because of it's ability to very quickly slide off logs and rocks back into the water when it senses danger. The hatchlings are approximately 1 inch in diameter growing to 10-13 inches as adults. The turtle has a top shell called a Carapace which is an oval that is somewhat flattened. Coloration is usually a dark green background with lighter markings.The bottom shell called the plastron is usually yellow with dark markings. The skin is green with irregular pale yellow lines. Males tend to be the smaller of the species but have a distinctly longer tail. Like many species of aquatic turtles they have a fixed tongue which makes eating in the water a necessity. *high quality clean water. It is best to use an aquarium water filter with frequent water changes. swallow it which can cause impaction. *the ideal water temperature of 78*F to 82*F .
*over all air temperature approximately 75*F.
*basking area approximately 85*F to 90*F where they can get completely out of the water. * adequate sized tank, a good guide is 10 gallons of water for every 1 inch of turtle. Red Eared Sliders need UVB while basking. This helps in the manufacture of their natural Vitamin D-3. The bulbs will need to be replaced every 6 months. 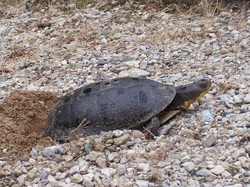 The turtle needs to be with in 18 to 24 inches of the UVB with nothing blocking full exposure. An aquarium heater with thermostat will heat and maintain water temperatures. A plain household light bulb is good to use for heat and visual light. Temperatures are mentioned above. Red eared Sliders are omnivores meaning they eat both at both animal and plant matter. As small turtles they are more carnivorous changing to herbivores as they mature. Their diet consists of a number of plants and aquatic life such as worms, crayfish, tad poles and insects to name a few. Offering a large array of meat based foods and aquatic plants will aid in keeping the turtle healthy. There is an excellent food chart on page 4 of the Animal Planet site listed below , It is not advised to feed the turtle any kind of dog or cat food. It is necessary to supplement calcium and vitamins. These are available specifically for turtles in pet shops and on-line. For calcium a cuddle bone can also be added to the diet. Red Eared Sliders have a fixed tongue and must eat underwater which can be very messy. It is advised to feed the turtle in a separate tank. This allows the residential tank to remain without feeding waste which can contribute to poor water quality. Red Ear Sliders do not shed their shells. Instead they periodically shed their skin and some may shed the transparent covering on the scutes of their shells. Mating occurs between March and July. The female does not reach maturity til about 5 years old and does not mate before then. After the mating takes place the female basks more often and for longer periods to keep her internal eggs warmer. She will lay between 2 and 30 eggs and can lay up to 5 clutches anywhere between 12 to 35 days apart. The eggs hatch in 60 to 90 days. The proper way to pick up a turtle is by supporting the legs in your 2 hands. If frightened the turtle may panic and scratch you . Holding the turtle securely can prevent falls which can be fatal. The following link is excellent information on handling. As with most reptiles, health problems are often attributed to poor husbandry and neglect. Some of the illnesses RES can get are fungus on their skin and/or shell, swollen eyes and soft shell together indicated poor diet, MBD, and they are susceptible to respiratory infections to mention a few. All of these need a vet assessment and treatment as soon as discovered. The following links provided much of the information presented here and contain more detailed information. Red Eared Slider care sheet and facts.